As of 1st February 2016, all landlords will be required to conduct a Right to Rent immigration check on prospective tenants. 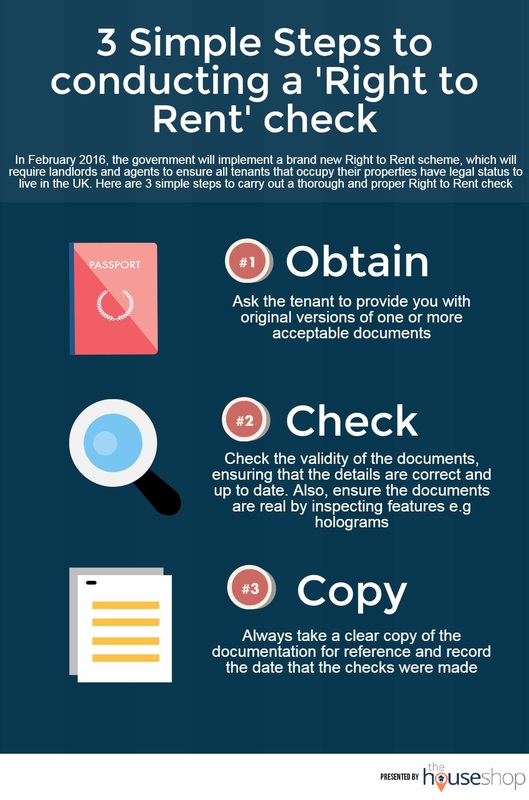 But what exactly is a Right to Rent check and what do they mean for landlords? Right to Rent is a new government scheme which requires all landlords in the UK to ensure that their prospective tenants have the right to be in the UK, and that they can legally rent their property if their tenancy commences on or after the 1st February 2016. By obtaining original and official documentation from the tenant, the landlord must confirm that the property they are looking to rent will be their main or only place of residence in the UK. Right to Rent checks were introduced by the government as part of the Immigration Act of 2014, to confirm that rental opportunities were awarded to those living in the UK legally. This was part of a broader attempt to improve efficiency and security of UK immigration practices overall. A Right to Rent pilot has already been successfully launched in areas across the West Midlands. So far, only one fine has been issued to a landlord. How Do I Conduct a Right to Rent Check? To conduct a Right to Rent check, you must validate the original documentation provided by the prospective tenant. Firstly, the landlord must affirm with the tenant; everyone aged 18 or over who will be living in the property (regardless of whether or not they will be listed on the tenancy agreement). Next, the landlord is required to check the prospective tenant’s documentation. Acceptable documents that would not require repeat checks include; A British Citizen passport, a national identity card confirming the holder is a national of the EEA, a registration document indicating permanent residence issued by the Home Office or a permanent residence card issued by the Home Office. These documents can be current or expired. Acceptable documents where there is a time-limited statutory excuse for a prospective tenant include: A current passport showing that the holder is allowed to stay in the UK for a certain period of time, A biometric ‘residence permit’ card issued by the Home Office indicating the length of stay or an immigration status document from the Home Office indicating that the named person may stay in the UK for a time-limited period. More information regarding acceptable documents and forms can be found on the GOV.uk wesbite. What Should I Do With Right to Rent Documents? Once you have received the correct documentation from the prospective tenant, it is advisable to take a photocopy of the original documents for reference and to check that the documents are genuine. It is also suggested that the date on which the checks are made is recorded too. A Right to Rent check may even be carried out by a third party or an agent of the landlord, provided both parties have an agreement in writing explaining that the agent is undertaking the check on the landlords behalf. Many companies provide a professional service which guarantees hassle-free communication between the landlord and prospective tenant. What Happens If I Fail To Carry Out a Right To Rent Check? If you fail to carry out a Right to Rent check or the original documentation provided is false, you may be liable to a penalty charge. The penalty charge given to landlords who have not successfully carried out the check could be up to the value of £3000. Repeat offenders could face imprisonment if Right to Rent legislation is not adhered to. However, landlords or agents undertaking the checks may be deceived by skilful forgeries and therefore will not be penalised on the grounds that some false documentation may look authentic.